Panel to consider sending Mo., Tenn. auto body cases to Fla.
A judicial panel will today hear arguments on whether to add two body shop vs. insurer cases into a collection of similar cases that will be decided by a Florida judge. The United States Judicial Panel on Multidistrict Litigation will decide whether or not to add Concord Auto Body Inc. v. State Farm Mutual Automobile Insurance Company et al, a Missouri case, and Price’s Collision Center LLC v. Progressive Hawaii Insurance Corporation, a Tennessee case, to the MDL proceedings in Florida. An MDL, short for multidistrict litigation, involves a series of similar cases in different federal districts — in this case, more than 20 states — which are heard by a single district court to avoid the inconvenience and burden on lawsuit parties and federal courts of the same facts being argued over and over again. The panel will hear the transfer cases without oral arguments. These type of cases usually see a decision in a couple of days, a panel staffer said. Concord v. State Farm is an Eastern District of Missouri case, and Price’s Collision v. Progressive is a Middle District of Tennessee case. The MDL is In Re: Auto Body Shop Antitrust Litigation, being considered by Judge Gregory Presnell in the Middle District of Florida. How Judge Presnell will handle transferred cases is obviously unknown. He’s already dismissed one complaint by Florida body shops with prejudice — meaning no do-overs — and the rest of the Florida allegations without prejudice, which will let collision repair attorneys refile them with different arguments by Feb. 10. However, an attorney for the shops said they’d expected this ruling and the case was far from over. Read RDN’s coverage of that ruling here. The Missouri case, which names many insurers as defendants, has already been given a conditional transfer order to Florida. 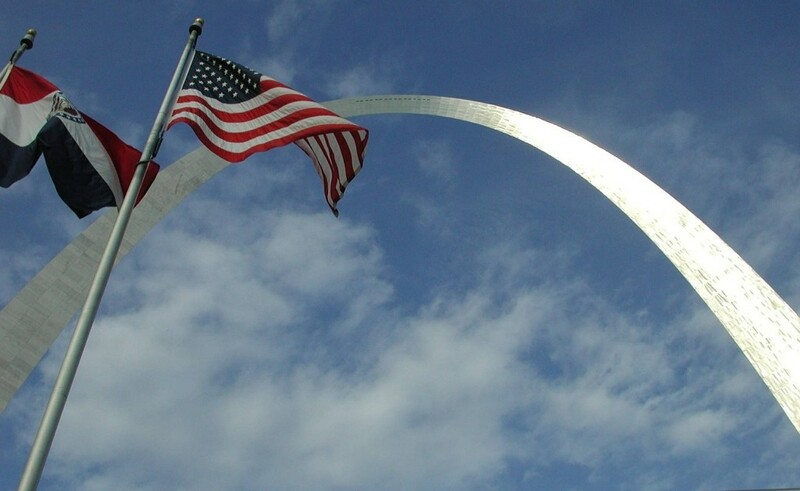 However, Farm Bureau Town & Country Insurance Company of Missouri, one of its defendants, has argued that its inclusion isn’t appropriate because Farm Bureau, like Concord, only does business in that state. Concord said the case is very similar to the others in the MDL, and so it’d be a waste of everyone’s time and money to duplicate the work with a separate Missouri case. 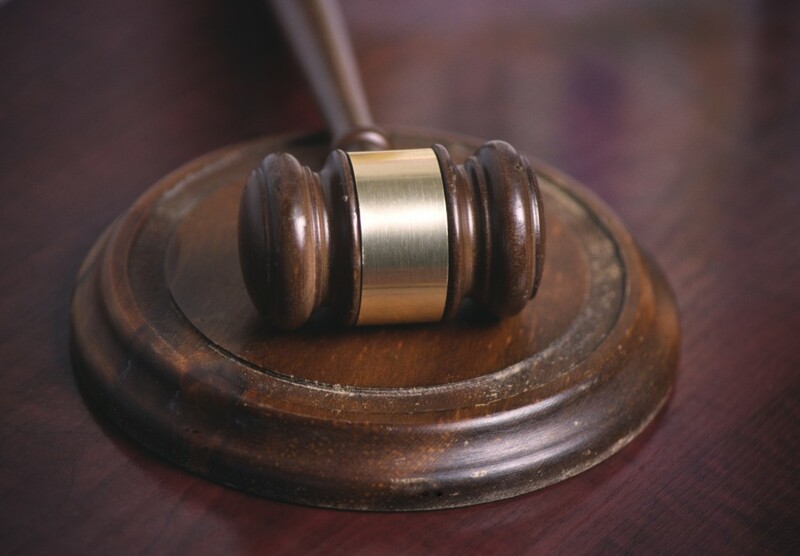 “Notably, Farm Bureau is the only named defendant insurer in the Concord action that opposes transfer to the MDL,” Concord wrote. Concord accuses State Farm of coercing and threatening the shop to make concessions and either get kicked out of a direct repair program or be punished by steering, or both. It also accuses State Farm of forcing an unfairly low labor rate on both direct repair program and non-DRP shops and the other defendants of refusing to pay any higher rate than State Farm’s. State Farm (and the rest of the defendants) hasn’t responded to the complaint yet. The Missouri proceedings appear to have been put on hold while everyone waits for the MDL decision. The Tennessee case is reversed in terms of support for joining the MDL. Progressive wants to be transferred, while Price’s Collision, which encompasses a chain of auto body shops, doesn’t. Panel Clerk Jeffery N. Luthi already determined in September 2014 that the case shouldn’t go to Florida, something that Price’s Collision pointed out in its opposition to the latest transfer request. 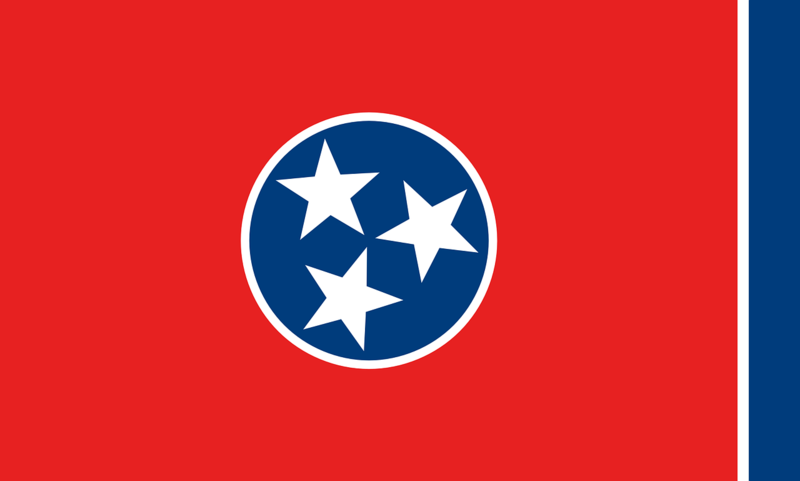 Price’s Collision argues that the dispute involves a Tennessee chain and a single insurance company, and attaching the Tennessee case to the MDL would waste all the work already done in that state. “Unlike the MDL cases here, there are no allegations of a conspiracy amongst insurance companies and no antitrust claims, and there are no allegations that Progressive uses a Direct Repair Program (“DRP”) membership to leverage concessions from PCC,” Price’s Collision argued in its motion against the transfer. Steering is a major component of the Price’s Collision case. 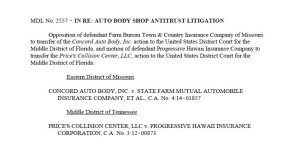 The body shop chain initially claimed that Progressive violated the Tennessee Consumer Protection Act and improperly interfered with Price’s Collision business relationships by steering customers. It also accused Progressive of breach of contract “by not paying the reasonable and necessary costs to repair each damaged vehicle” as agreed in the contract, according to District Judge Kevin Sharp’s summary of the case. Breach of Contract: Progressive argued that Price’s Collision wasn’t a party to the contract allegedly breach, and so had no standing to sue. Price’s Collision said that two insured women whose vehicles it repaired assigned the chain their contractual rights to go after Progressive for money owed the women under the policy terms. Therefore, Price’s Collision says, it can pursue the full amount it feels is owed for the work done on the vehicle. For now, Sharp has allowed Price’s Collision to continue with that complaint. Tortious interference: Price’s Collision accused Progressive of improperly affected its business relationships “by actively discouraging its insureds from having repairs done at Price’s Collision, by publicly and privately discrediting Price’s Collision, and/or by refusing to pay the full amount for required and proper repairs,” according to Sharp. Progressive argued that Price’s Collision didn’t have any evidence besides “vague assertions” and it couldn’t have interfered with business relationships as all the specific customers cited by Price’s ended up giving business to the body shop chain anyway. At this point, Sharp ruled, the law lets Price’s Collision have a chance at pursuing this allegation in court, noting that to win, it’ll have to prove “non-speculative” damages to relationships with current or potential customers. Featured image: A judicial panel will today hear arguments on whether to add two body shop vs. insurer cases into the slew of similar cases that will be decided by a Florida judge. The image shows part of a notice of hearing about the proceedings.